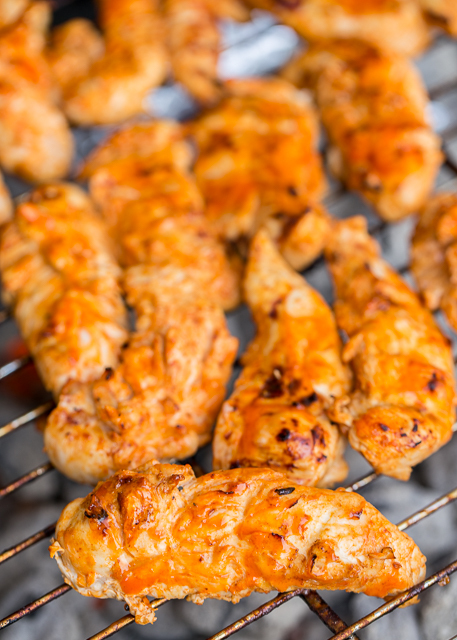 Orange Buffalo Grilled Chicken - chicken marinated in buffalo sauce and orange juice - grill, pan sear or bake for a quick weeknight meal. A little spicy, a little sweet and a whole lotta delicious! Ready to eat in 15 minutes! 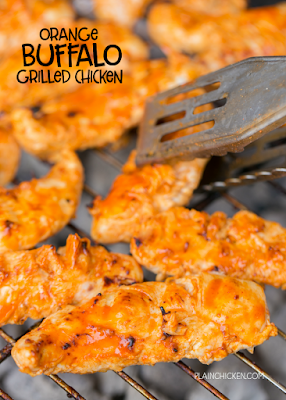 This Orange Buffalo Grilled Chicken is a fun twist on regular buffalo wings. We have a sports bar that we frequent in town and they serve grilled chicken fingers. 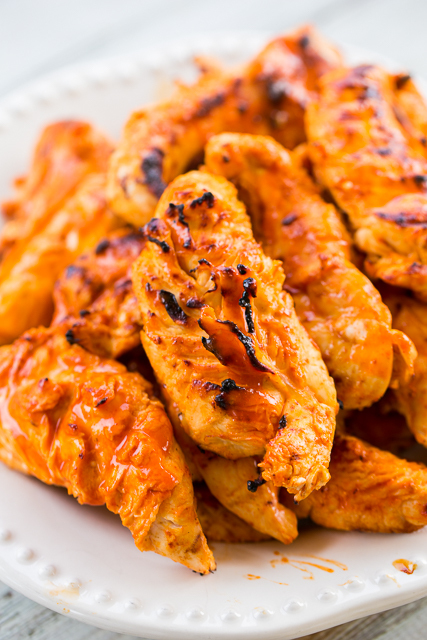 I LOVE to get the grilled chicken tenders tossed in buffalo sauce. It is my favorite! I like wings, but I definitely prefer grilled chicken. This Orange Buffalo Grilled Chicken is becoming a favorite. The recipe only has a few simple ingredients and it tastes great. The orange juice helps to mellow out the buffalo sauce, so it isn't super spicy. I used Frank's Buffalo Wing Sauce (you can use just plain hot sauce if you prefer). I saved a little of the marinade to brush on the chicken as we were taking it off the grill. This Orange Buffalo Grilled Chicken is great as a main dish or on top of a salad or in a sandwich wrap. We LOVE to make extra chicken for leftovers. My favorite is to heat it up in a tortilla with some cheddar cheese, mushrooms and a drizzle of Ranch. SO good!! Whisk together hot sauce, orange juice, garlic, oil and salt. Pour over chicken and marinate in the refrigerator a few hours to overnight. Remove chicken from marinade and sauté or grill until done.